Steam cleaner reviews and ratings, this is where we discuss brands like Scunci, Oreck, Eureka, Monster, Haan and other steam cleaners. We compare steam cleaners and review them based on their features, price, performance and more. On this page we look at reviews and ratings of steam cleaner brands that you may not be familiar with. The most popular brands and types are linked to on the left column where you can read about their features, customer reviews and different models. Check the left column if you want to find reviews on Shark, Bissell, Hoover, Steamfast, VaporClean and Steamboy steam cleaners. On this page you will find reviews of Scunci, Eureka, Oreck, Monster, Haan, Daimer and other steam cleaners. These brands are not as popular as the others, however, they are top quality steam cleaners. You can find reviews of them a bit further down this page and we provide them so that you can get a comprehensive view of all the options you have when purchasing a steam cleaner. Covered in these steam cleaner reviews are the special features each one of these brands carry which may be exactly what you need. Besides reviews we also compare steam cleaners and provide consumer ratings throughout this website. 1. 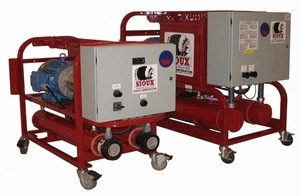 Boilers: The best quality steam cleaners have aluminum or stainless steel boilers. If you’re purchasing a heavy duty, commercial grade or steamer that costs $300 + then it is important that you get one where the boiler and heating element are not welded together. Trust me, this will save you $ in the future when either one of these parts need to be replaced. 2. Steam control: Being able to control the output and pressure of the steam is important for efficient cleaning. 3. Capacity of water reservoir: This will directly affect how long you will be able to steam clean for. The larger the reservoir, the longer you can clean. It is also a good idea to have the continuous fill feature if you plan on steam cleaning for more than an hour. 4. Safety features: Steam is heated vapor which should not come into contact with your bare skin. There should be safety or design features installed to ensure that you don’t get hurt. 5. Power Cord Length: The length of the cord will determine how wide of an area you can clean. If it is less than half the length of the room… then you know you’ve got problems. This can be remedied by using an extension cord, so it isn’t a do or die factor. 6. Exterior housing: The exterior housing of the steam cleaner should be strong and durable. If not, I’m afraid your steamer won’t last very long. It is best that you buy a steamer with a housing made of hard plastic or stainless steel. These are just a few things to pay attention to when deciding that you need a steam cleaner. Besides looking for the above characteristics it is important to know what are your cleaning needs are and what type of cleaner is best suited for them. The various types include handheld, canister, upright, carpet steam cleaner, commercial, industrial and heavy duty. Below are the reviews of steam cleaners that would be great candidates to suit whatever your cleaning purpose may be. A complete review of the Monster steam cleaner and their various models which include the Monster steam cleaner SC60, 1200 and EZ1 steam mop. We look at the Scunci SS1000 and Scunci ProSteam Steamer. We review the Fantom Handheld steamer and the Fantom SC925 Professional. We discuss the pros and cons of Oreck steam cleaners and what makes this steamer unique. In this review we look at the Saeco Piccolo 95 which is highly rated and is a rare combination of excellent quality and affordability. We look at various models of Karcher steam cleaners that will help you decide which one is best for you. A review of Fury steam cleaners and the two companies that produce them (SteamPlus and Spartan). The Fury steam cleaner is a commercial and industrial steam cleaner that should not be taken lightly. We review the Dirt devil steam cleaner and the various models you can purchase. We cover the Dirt devil steam mop, handheld and the carpet cleaner. This article reviews the Rainbow steam cleaner which is an “As seen on Tv” product. We look at the features and consumer reviews. The Brain Child of SteamTech Corporation We dive into the Series steam cleaners and look at their three main models: The SteamTech Series III, IV and V.
We review the Pullman steam cleaner, specifically the Pullman-Holt Executive Housekeeper steam cleaner which can be bought through HSN. The Daimer steam cleaner is a heavy duty home and industrial cleaner. It offers strength, durability and environmentally friendly cleaning. Daimer steam cleaners are excellent tools to add to your arsenal of cleaning products. We review the Sioux steam cleaner and the many uses and applications of this industrial type cleaner. This is a handy dry vapor steamer that has the capacity to steam clean up to one and a half hours.